Thread: Help me to solve a family Mystery: My paternal line before my great grandfather. I may have made some possible progress. I stress "possible" as it is tentative. My 3 closest matches (consisting of two surnames Adamthwaite & Guess), might be connected via the surname Fawcett/Faucett/Fawssett/Fawsett etc. Fawcett is very localized name in England with the highest frequencies in 1881 occurring in Westmorland England...same place the Adamthwaite men's MRCA is from. 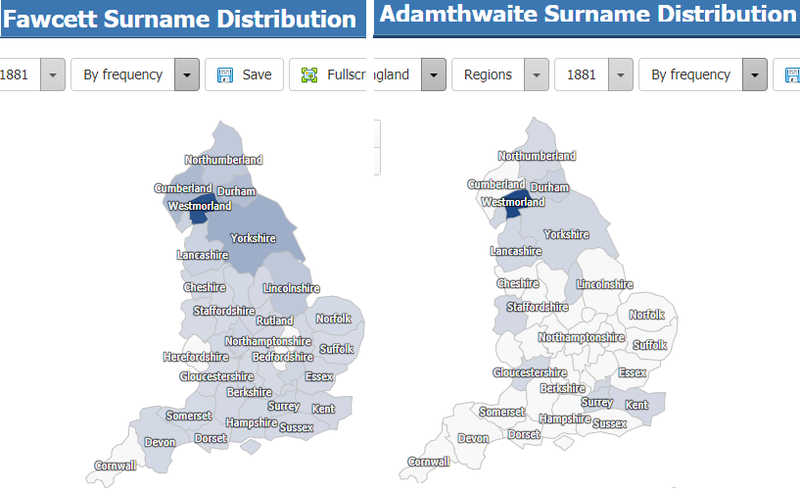 The 2 Adamthwaite men don't match any other Adamthwaite lines in the Adamthwaite FTDNA project. And the Guess match doesn't match any other Guess/Gest/Guest etc men in the Guess FTDNA project. The surname Fawcett is found in the records of the Adamthwaite farm (where the surname originates) and nearby town of Ravenstonedale. My "Guess" match, his paternal half brother, and his paternal 1st cousin share a 79cM ancestry.com match to a man who's Fawcett ancestors lived near the earliest known Guess ancestor in Orange Co. NC in the 1700s. There are no surnames in common between the Guess family tree and this 79cM matches extensive tree. If my Guess match and this 79cM match both descend from this Samuel Fawcett then they would be 5th cousins which is in the range for a 79cM match. Right now this all tentative, but it's the first time I've found a surname (besides the frequent ones like Smith & Taylor) that is common in both of these rural areas in Orange Co., NC (earliest Guess location), and Ravenstonedale, Westrmorland (Adamthwaite location) in the 1700s. If my 3 closest matches turn out to descend from a Fawcett paternal line then the following may be of interest. On the first post of this thread I mentioned that the mother (Elizabeth Margaret Mitchell) of my father's illegitimately born (b. 1893) paternal grandfather; lists her address at the time of birth as a seamstress at 20 Green Lane, Hammersmith,London, England. There is/was no Green Lane in Hammersmith, but there was a Brook Green Rd that used to be called Brook Green Lane up to at least the 1880s. From 1891 to 1893 there was a William Vincent living at 20 Brook Green Rd. In the 1891 census he lists his occupation as taylor. So maybe this is where Elizabeth Margaret Mitchell was working as a seamstress at the time of birth in 1893. Next door at 21 Brook Green Rd from 1891 to 1893, there lived a father Leonard Lemale Fawsett Sr (1850-1915) and son Leonard Lemale Fawsett Jr (1873-1901). Probably nothing, but if this Fawcett connection turns out to be true, then I need to revisit these two Fawsett men. Again this could a be false lead as my MRCA to to my Guess & Adamthwaite matches may have occurred prior to the introduction of surnames in England. Last edited by MitchellSince1893; 06-20-2018 at 05:29 AM. Step 2. Buy a kit for everyone that lived within 500 miles of where you're interested in. Step 3. Try not to wake up from the fantasy. Have you uploaded your father's DNA to MyHeritage? Some people have tested there and only there and it's also free to upload. Last edited by MitchellSince1893; 06-20-2018 at 04:13 AM. Interestingly, there is a large Fawcett family here in South West Pennsylvania. Cecil Township, Washington County to be specific. I am sure this Fawcett family has been here a very long time. But being a very old colonial family, I wonder if anyone from this family has done DNA testing? This particular Fawcett family is connected to the Boyce and Morgan families as the National Cemetery that I work at was once owned by two Morgan brothers who are descended from Colonel Morgan who turned Aaron Burr in to Thomas Jefferson for the treason plot. The Fawsett family you are looking at never came to the U.S., I assume? ...The Fawsett family you are looking at never came to the U.S., I assume? If you are referring to the Fawsetts of Hamersmith, London, then I'm not sure. While I've gone up the tree to Norfolk, England (if the online trees are correct), I haven't gone back down and researched all the brothers to see if any migrated to the US. I went back to a Leonard Fawsett (1652-1729) of Castle Rising, Norfolk. From what I can tell, not too many Fawcett (and various spellings) men have done y-dna tests. Last few days I've been filtering through my father's and his paternal half sister's myheritage matches to see if anything of interest pops up. 30 years of trying to solve my family mystery with multiple dna tests and tons of research and nothing (ok I've made a tiny bit of progress as seen in this thread). My wife's paternal grandmother also had a family mystery about her mother's ancestry. Her grandmother's dna test results came in today. 15 mins after looking at her ancestry.com matches and I've solved the mystery. Why couldn't my mystery be so easy to solve? I guess a positive way to look at it is; all this effort on my family mystery, gave me the experience to quickly solve my wife's family mystery. Just for comparison I have 221 people in the ‘4th cousin’ category and many/most are UK, but 80% are USA in the more remote cousins. Overall my matches grew by 30% in 3months. I was really pleased for you to read the Fawcett idea. When I get a fresh idea/lead I get fresh energy and it is great to read that you were able solve your wife’s mystery so quickly. Out of 64 pre 1800 births 45% Cheshire, 1% Irish (or Scottish), 25% south Derbyshire, 13% Burton on Trent area (where 4 counties within 10 miles), 7% Shropshire, 1% Staffs, 8% Lancs. So far all British Isles despite what some testing companies say. My father and his paternal sister's new ancestry.com results are out. Paternal half sister also shows 66% England & Wales, and NW Europe, 31% Ireland & Scotland, 2% Sweden, 1% Western & Central India. Based on the above, an estimate of their father (grandson of mystery man) would have approx. the following results at ancestry.com. So this might indicate the mystery man had significant Scottish & Irish ancestry to make of the difference between 36% and 15.6%. Or it may just be that ancestry.com is over estimating Irish & Scottish in my father and his sister. Last edited by MitchellSince1893; 09-13-2018 at 09:50 PM. Since anthrogenica.com was down, I have made a little progress in this effort. a. For some reason my father thought that Elizabeth Margaret Mitchell's (EMM) married name was Atkins...but I have found nothing on this, except that the next door neighbor in the 1891 census was a married man named Charles Joseph Atkins (b ~1853 in Bishop Monkton, Yorkshire). I've wondered if he might be the father but my father has no close y dna matches to any Atkins and I've found no autosomal matches to this line of Atkins. In a family Bible, filled out by my father's mother in 1965, she put down Edward Leopold Mitchell's mother as "Margaret Atkins" and father as "John Rintoul Mitchell" but this wasn't correct. "Margaret Atkins" was really "Elizabeth Margaret Wilhelmina Mitchell" (source for my surname). "John Rintoul Mitchell" was actually her father. My father had no idea why his mother put this in the Bible, and until last week, neither did I. In 1992 I discovered in the 1891 England census (just 1.5 years prior to Edward Leopold Mitchell's conception), that Elizabeth Margaret Mitchell and family were living next door in Fulham, London to a Charles Joseph Atkins and family. Since then Charles Joseph Atkins (or a close Atkins relative) has been a prime candidate for the "mystery man"...possible surnname, at the right place and time. In 1909, EMM comes to the US from England, and is listed as "Elizabeth Mitchell" on the ship's roster. In the 1910 US census (taken on April 15th 1910), she is listed as "Eliza Mitchel", living in Mobile, Alabama. I knew that some time between 1910 and 1920 census she married a William A. Whitcomb, but couldn't find a marriage certificate for them. Fast forward to last week when I discovered a Mobile, Alabama marriage certificate dated Feb 4th, 1913 for "William A. Whitcomb. To my surprise his bride is listed as "Margaret Wilhelmina Atkins (widow). So that's how the "Margaret Atkins" name ended up in my Family Bible. But why was she going by that name? I've searched and found no marriage between an Atkins man and Mitchell woman in the US or UK that would work. Plus as I mentioned, less than 3 years prior she is going by "Elizabeth Mitchell" I guess it's possible she could have gotten married, her Atkins husband died, and then she got remarried all in the span of 33 months, but I doubt it, as there is no record of this marriage. This new information motivated me to find a living relative/descendant of this Charles Atkins in the 1891 census. Previous efforts on my part had failed to make any head way. Keep in mind that Charles Atkins might not have necessarily been the mystery man...maybe he had a visiting unmarried Atkins cousin. As I mentioned, since 1992 Charles Joseph Atkins (or close male relative) has been a front runner to be the mystery man. there's a 71% chance that 4th cousins will match on ancestry.com. Also the site states there's a 30.7% probability that no detectable dna relationship exist between two random 4th cousins. So what is the probability that this Charles Atkins relative wouldn't match any of my 3 ancestry.com kits? I estimate it to be around 15%. As it stands, Charles Joseph Atkins or close male relative aren't looking like good candidates to be the mystery man. Last edited by MitchellSince1893; 11-03-2018 at 10:43 PM. Thanks for sharing. What a "whodunit"! If you ever figure this one it, I suspect it will be an answer that stretches your current imagination. Update: Leaving no stone unturned; this Charles Joseph Atkins relative is a direct male line descendant of Charles J. Atkins paternal grandfather. He has graciously offered to take a y-dna test. This will conclusively determine whether or not my paternal line descends from this particular Atkins line. I am very grateful to him. Should know something by the end of the year. Charting Companion from Progeny Genealogy will enable you to do some DNA Simulations with autosomal DNA, to empirically identify possible connections. Is My Paternal Line Armenian?